“There is good potential for developing the bilateral relations between Azerbaijan and Kazakhstan,” said Prime Minister of the Republic of Azerbaijan Novruz Mammadov as he met Minister of Digital Development, Defense and Aerospace Industry of the Republic of Kazakhstan Askar Zhumagaliyev. 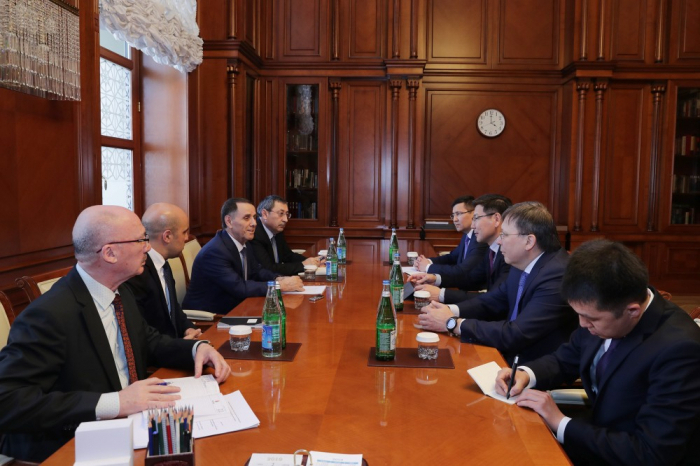 They emphasized that Azerbaijan and Kazakhstan are interested in taking maximum benefit from the opportunities offered by the international transport corridor which stretch between China and Europe. The sides also exchanged views over joint activities in the Caspian Sea, cooperation in transport, communications, defense industry, space industry, ICT, including in the spheres of digitalization, and other issues of mutual interest.